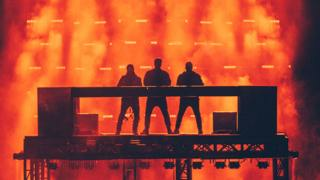 Swedish House Mafia are reuniting for a show in their home city of Stockholm in Sweden – five years after their split. The DJs held a live-streamed press conference on Monday to say they would be performing at the Tele2 Arena on 4 May 2019. A week-long countdown clock hyped the announcement in which they also said they’d be touring with new music. Rumours of a reunion began after they made a surprise appearance at Miami’s Ultra Music Festival in March. Posters of the EDM supergroup, made up of Axwell, Steve Angello and Sebastian Ingrosso, also popped up around the Swedish capital – leading people to speculate about a comeback. All three DJs spoke entirely in Swedish during the press conference and didn’t give any details about where and when they would be touring after the Stockholm gig. But they did confirm that further gigs will be announced. The DJs who influenced a whole generation of EDM stars reportedly said that their individual music projects would be put on hold while they worked together. They didn’t give many clues about what to expect but according to comments under the press conference live stream, they said the response to their Miami reunion gig made them think about a comeback. Swedish House Mafia became one of the biggest house DJ groups after forming in 2008. They won a Grammy in 2012 for Save the World and in 2013 for Don’t You Worry Child. The group has more than two million fans on Twitter and more than seven million on Facebook. Tickets for the Stockholm gig go on sale on Saturday 27 October.